No Man’s Sky Visions update drops tomorrow and you can peruse the patch notes in advance. Following last month’s The Abyss update for No Man’s Sky, Hello Games announced this month’s Vision update – rolling out tomorrow – and they’ve shared more details along with patch notes. Players can look forward to new shades of sky and grass, and new types of water, while “atmospherics and skies have been improved,” and – most fun of all – stormy weather conditions will occasionally result in rainbows. As well as new archeology, like ancient bones, exotic artifacts have been added to planets and can be taken back to your base and displayed as trophies. The last of the new features includes procedurally generated crashed freighters, and a new Community Research mission with shared progress, that will unlock the new Eye of the Korvax helmet, new emotes, building parts, and fireworks. Fixed an issue where players could be prevented from earning a free freighter in the tutorial. Allowed the Dreams of the Deep mission to detect if the a Nautilon Chamber had been built nearby before the mission started. Fixed an issue where missions that visited trade terminals could advance without their objective being completed. Fixed an issue that prevented higher level Aeration Membrane upgrade modules from appearing in the Space Station tech shops. Fixed an issue that prevented Freighter Hyperdrive upgrade modules from appearing in the Space Station tech shops. Fixed an issue where players could fail to learn the Living Glass blueprint at the correct time. Fixed an issue where players could fail to learn the Exocraft Boost blueprint at the correct time. NipNip blueprints can now be acquired from the Base farmer after their mission chain is complete. Fixed an issue where NPCs awarding procedurally generated upgrade modules would select from an insufficiently random pool. Fixed an issue that prevented some doors + items that require Atlas Pass v1 from accepting v2 or v3. Adjusted the behaviour of wanted level timers, so that the wanted level decays as the timer does. Improved the appearance of the planetary readout from space. Added a new section to the inventory item popup hinting at the item’s use. Improved the visual feedback when collecting items, especially rare items. Improved the text labels for armoured objects. Added a filter for “Not Owned” to the Quicksilver Shop. Fixed an issue which would allow players to browse their existing fleet whilst purchasing a new frigate. Fixed a rare case where certain game inputs could temporarily fail to be recognised if remapped then reverted to defaults. Prevented an erroneous boost icon appearing while piloting the Nautilon (on PS4 and Xbox One). Fixed an issue preventing building multiples of storage container 1 (on PS4 and Xbox One). Fixed an issue where extreme weather planets could fail to generate storms. Improved the distribution of ammonia and uranium on toxic and radioactive planets. Improved some analysis visor text descriptions. Fixed an issue where the terrain manipulator could destroy valuable objects. 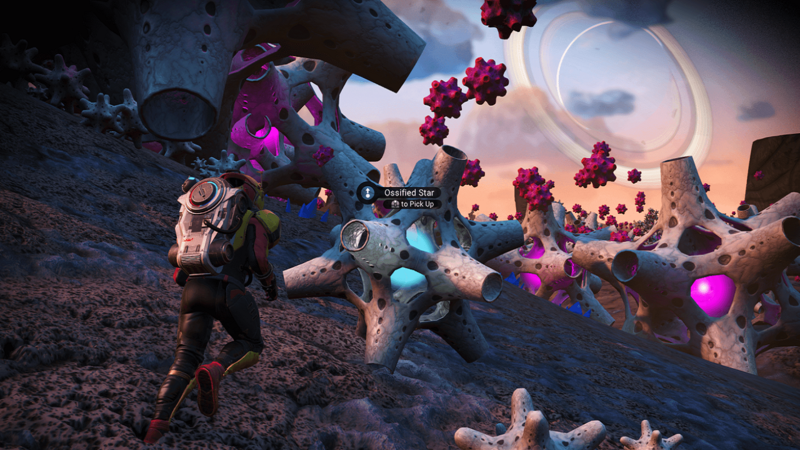 Fixed an issue where other players’ discoveries could prevent fauna and flora from being scanned with the analysis visor. Added identifiable descriptors for all anomalous planet types. Fixed an issue where resource crystals (eg Di-Hydrogen) could be rediscovered on every planet. Fixed an issue where many minerals would be called Yukovsite. Allowed the torch to be used when exploring crashed freighters. Fixed an issue where exocraft customisation colours could be incorrect until refreshed in the customiser. Fixed a rendering issue with oversized fungi. Fixed an issue where stationary objects could sometimes appear blurred. Improved the draw distance on some exotic planet objects. Fixed some out of memory crashes. Fixed a crash when quitting the game during a gesture.